Like most kids, my daughter is a Mac-n-Cheese girl. I don’t mind that at all, I always make our macaroni and cheese from scratch, so it is free of any processed ingredients. Since we make it regularly, I am always looking for ways to dress up our favorite dish for the adults. My daughter doesn’t like all of my experiments, but she does accept the addition of leeks. She doesn’t mind their mild crunch and we love their fabulous onion flavor. 1. Preheat the oven to 400ºF. Cook pasta in heavily salted water according to package directions. Drain and set aside. 2. Melt the butter in a large straight edge skillet or deep pot over medium heat. Add the chopped leeks and saute until they are tender and translucent, about 12 to 15 minutes. Stir in the flour and stir constantly for 2 minutes. Gently pour in the milk and bring it to a low simmer. Stir the milk often so that it does not burn on the bottom of the pan. Add the cheese and stir until it has melted. Then turn off the heat and remove the pan to a cool spot. 3. Crack the eggs into a small mixing bowl and gently pour about 1 cup of the hot cheese mixture into the bowl, whisking continuously. This will temper the eggs so that they don’t cook when they are added to the cheese sauce. Pour the egg mixture into the skillet of cheese sauce, whisking constantly. 4. 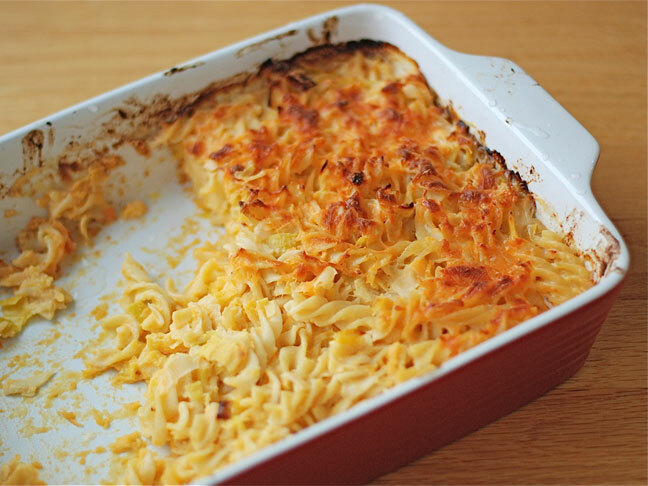 Place the cooked pasta in a 13×9 baking dish. Pour the hot cheese sauce over the pasta and stir it in to make sure it is evenly coated. 5. Bake for 30 to 35 minutes, or until the top of the pasta is browned and the cheese sauce is bubbly.